If you need a deep cut on a material that possesses writing or any other form of representation, this the technique to get. The process involves laser emitted beam that melts the material used services avoiding the patterns on the beam. For the laser, in this case, it operates by producing a high amount of heat that makes the material used to melt and vaporous on the affected area of the surface. It is characterised by deep cuts, which, when decorated with a shiny substance becomes more easily identifiable. Typically, the engraving goes up to 0.02 inches in the case of metallic material and 0.125 for other kinds of materials. The techniques are used when making marks on top of the material. The method is suitable for almost every possible material’s shape. For instance, you can mark the rounded, flat or any curved shape. Marking is doable on different kinds of materials, including the metallic and plastic materials. In this method, the material is discoloured to create noticeable marks that can be in the form of writing. In achieving the results, the laser machine uses oxidation below the surface that in turn makes the surface look dark. For this reason, the technique is also referred to as dark laser marking. The results look like a high contract on the top of the material used. In most cases, marking serial numbers or making some model codes use this technique. This method does not tamper with the material since it does not involve any cutting. Laser etching is an engraving service that involves cutting the material. However, unlike the laser engraving, the cut made in the method is much shallower. The cut is often less than 0.001 inches deep. The sign etching services are typically used when dealing with thin materials. Small objects are also cut using the etching process. The primary reason is to ensure that the engraving process does not destroy the thin material. 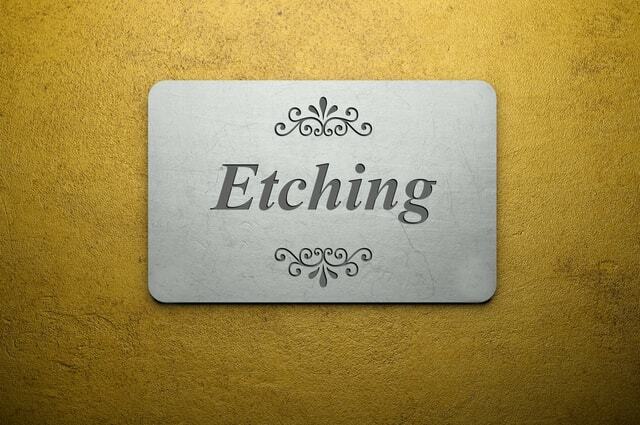 Valuable commodities such as jewellery are engraved with an etching process. This entry was posted in Able News and tagged engraving, etched, etching, laser, marking, signs on 17th April 2018 by admin.